Site: Machine cut, hand finished, natural (no exposed contours) with landscaping, roads, walks, people, cars, water features. Full detailed buildings with windows, facade and roof fenestration. Building to include full texture and color representation. All setbacks indicated including window and door setbacks with all color site of the Architectural Model Maker. Tribeca Village will be developed in Middleton, Wisconsin on a 24-acre site that sits between the new U.S. Highway 12 and old U.S. Highway 12, since renamed Parmenter Street. The project is anticipated to become the gateway toMiddleton and will be a true mixed-use development, a place where you can live, work and shop. The triangular site will be densely developed and will contain a surprisingly wide variety of uses unlike any other development in the county. When completedTribeca Village will contain one million square feet of building space with an estimated value exceeding $225 million. 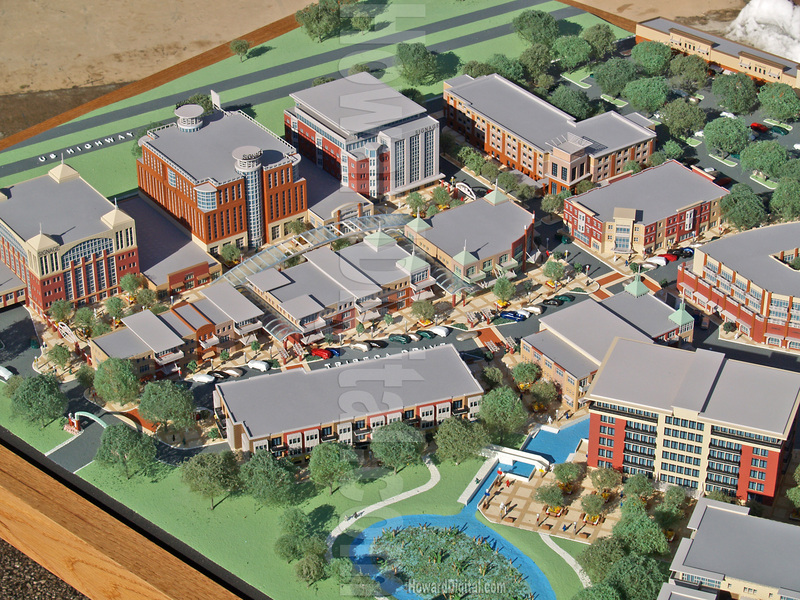 The majority of the space will be devoted to six office buildings comprising a total of 440,000 square feet. Another 326,000 square feet will be dedicated to retail uses, in addition to 169 apartments and condominiums, including workforce housing. Three buildings, totaling 46,000 square feet, will be devoted to dining and entertainment uses. In addition, there will be one four-story hotel.